(Long Island, NY) Assemblyman Chad Lupinacci (R,C,I – South Huntington) attended a Community Read Aloud at Southdown Primary School in Huntington on Tuesday, January 20, to support the non-profit organization Read Aloud 15 Minutes and their “Plant the Seed, Read!” campaign. 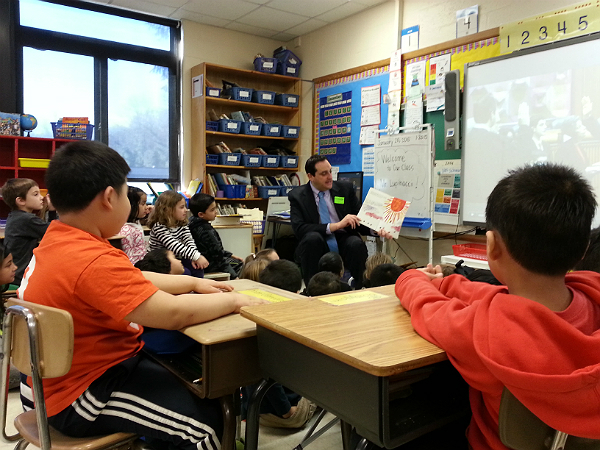 Lupinacci read to students and answered questions regarding his various responsibilities as an assemblyman. As a member of the Assembly’s Committee on Higher Education, Lupinacci often takes part in events that foster a love of education in students. Assemblyman Lupinacci reads to students at Southdown Primary School. Photo Credit: NYS Assembly. The “Plant the Seed, Read!” campaign encourages children to read aloud for 15 minutes a day to improve their literacy skills and prepare them to further their education. Assemblyman Lupinacci, a professor at several local universities, including Farmingdale State College, Hofstra University and St. Joseph’s College, also had the opportunity to speak with both teachers and school administrators to learn about other exciting programs underway in the school.